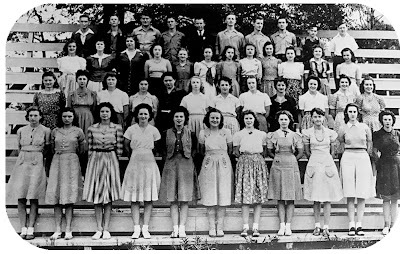 In 1992 the graduates of Lyon High School, Covington, Class of 1942, held their 50th class reunion. Here's the article about who attended. Click on the image below to make it larger and more readable. Bottom row: Cloa Holden,, Marguerite Sharpe, Rita Stire, Erma Lee Russell, June Koepp, Madeline Dunn, Audrey McMurray, Ellen Simmons, Cora Lee Findley, Jo Alice Bougere, and Elaine Magee. Second Row: Elizabeth Schroeder, Gloria Bischof, Dorothy Jenkins, Hazel Kennedy, Margie O'Keefe, Betty Hard, Alta Williams, Caro Pearl Rousseau, Ollie Ball, Helen Sandifer, Mary Phillips, and Dorothy Watts. Third Row: Virginia Long, Gloria Bradburry, Meda Koepp, Lois LaCroix, Evelyn Taylor, Elva Kennedy, Anna Lowe, Joyce Davenport, Muriel Erwin, Janice Pierce, Mildred Wehrli, and Lorraine Lester. Fourth Row: Lawrence Peters, Sidney Grantham, Flasdick Hawkins, Sidney Huval, Aaron Fitzgerald, Jack Lee, Zack Lee, Alex Ferrer, Frank Shortridge, and Harold Burns.